Statistics is the branch of mathematics which deals with the all aspects related with the data. It involves collection, organization, presentation, interpretation and analysis of the data. Data can be collected using experiments, surveys or by recording exact events. 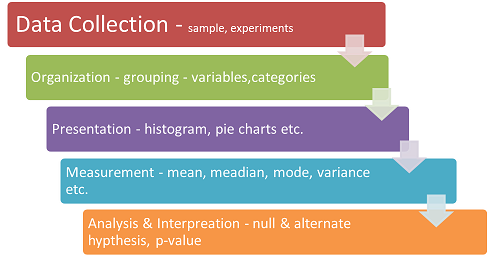 In case of experiments or surveys, collecting a representation set of data is very important to do right analysis. In statistics, when data is collected through some experiments or by sampling process, generally it is not in an organized format. This data is called Raw Data. These techniques helps students to measure the spread of the data as well as tendency towards central. It is very important to understand, which concept need to be applied to get the right answer for different type of questions. Once, you have a good understanding of these concepts, we suggest you to test your knowledge to master these skills using following links.